As I mentioned before, walking in Chennai is no picnic, on account of poor sidewalks and the never-ending din of traffic. I could only assume that running, a morning habit that I’d have a hard time giving up, would be a nightmare. But, pleasant surprise! It’s actually manageable just after sunrise, at about 5:30 a.m., when the streets are relatively calm and the heat of the day hasn’t set in. 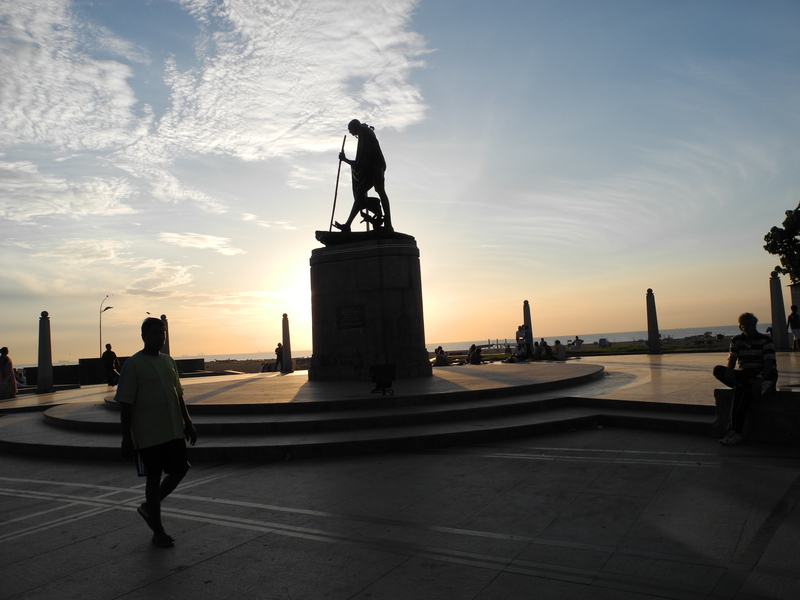 I headed to Marina Beach, purportedly the second-longest in Asia, thinking that I and the fishermen would have it to ourselves. Actually, it seems like half the city had the same idea. As the sun rises above the eastern ocean, the promenade is thick with people taking their morning exercise: Husbands in workout clothes powerwalking alongside wives in full saris (sometimes with sneakers underneath). Little kids circling around in a roller rink. Groups of young dudes charging alongside each other. Yoga sessions. Boxing lessons. If you’re a cow, there are long patchy lawns to romp on, or simply graze. Part of the parade carried an air of dutifulness: Diabetes is rampant in Indian cities, where jobs tend to be sedentary. In Chennai, there are sweet shops and bakeries everywhere—not to mention fried street food—and few apparent gyms or fitness clubs where someone with high cholesterol might work it off. So I think it’s a safe bet that many of those morning constitutionals are on doctors’ orders. 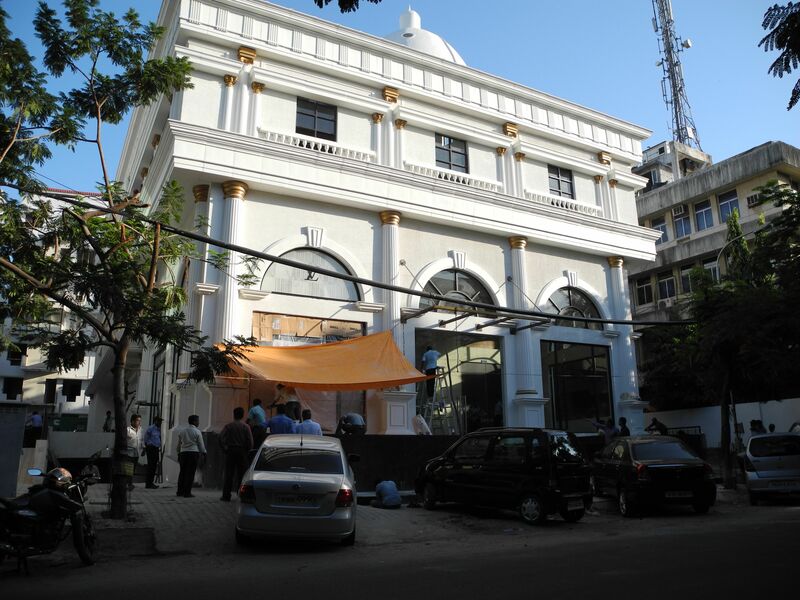 It’s Day 3 in Chennai, and I’m on information overload. But blog posts needn’t be! I’m going to try to break things down into bite-sized pieces, starting with the thing I’ve been doing most of: Walking. At the same time, though, people walk. Everywhere. In American cities and suburbs, when roads don’t at least have shoulders, people tend to avoid them. 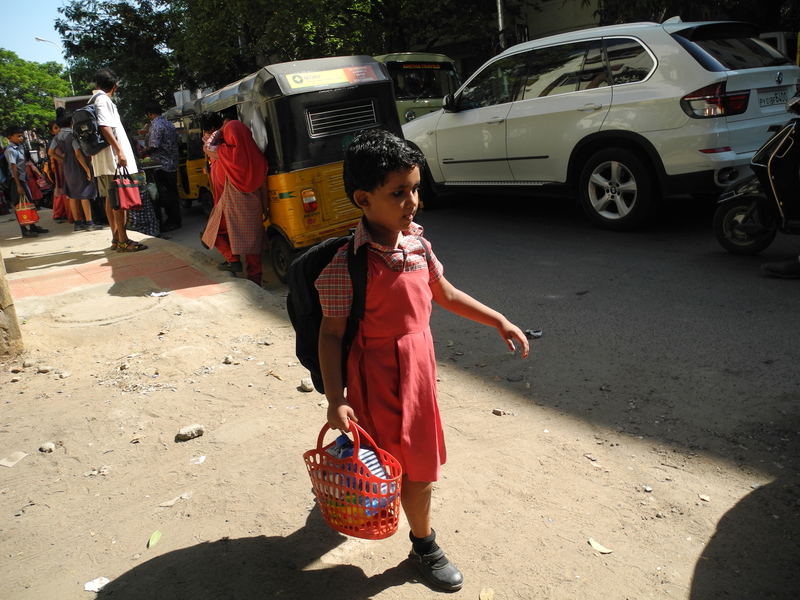 In Chennai, there is no street where even old people, women, and children can’t be seen hustling on their way. The best way to do it is in groups, or at least by attaching yourself to a group: When a critical mass of people builds up on a median in the middle of the road, the traffic is forced to flow around them. On truly impassable roads, the Corporation of Chennai has sometimes installed underpasses, but I’d take my chances on the surface over the smell and darkness underground. The latest idea is skywalks, but it seems that natives might make the same choice, if faced with the prospect of climbing several stories up just to cross the street. 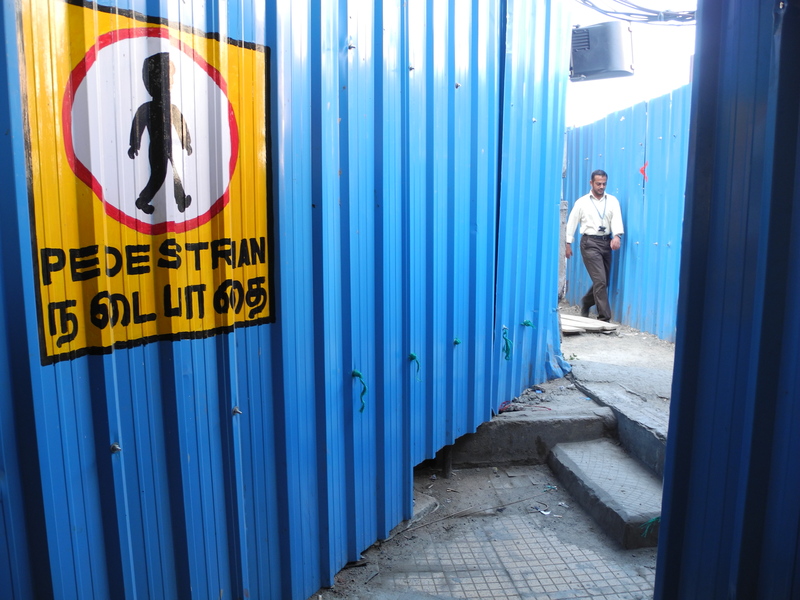 The city makes some provision for people walking around the giant Metro rail construction sites. To avoid the eye-level unpleasantness, those of modest means may hail an auto-rickshaw, one of the buzzy two-seater mini-taxis that saturate the city. I haven’t done much of that yet—understanding the city on a granular level, and how things relate to each other in space, is still only possible on foot. 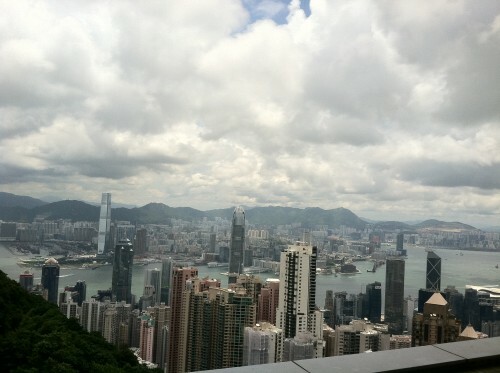 Every tourist’s view from the Peak. Totally by accident, I booked myself a 15-hour layover in Hong Kong. Not surprisingly, it’s been a fascinating start to the trip. Let’s start with the density, because it manifests everywhere you look. There are cars everywhere, but no surface parking lots, and I doubt underground ones; they’re all in relatively well-disguised garage structures. Blog for a living long enough, and you start to need the format to process the world. Thus, this two-month employment hiatus will be chronicled, to the extent that I can find wireless internet wandering around India (precise itinerary still TBD). 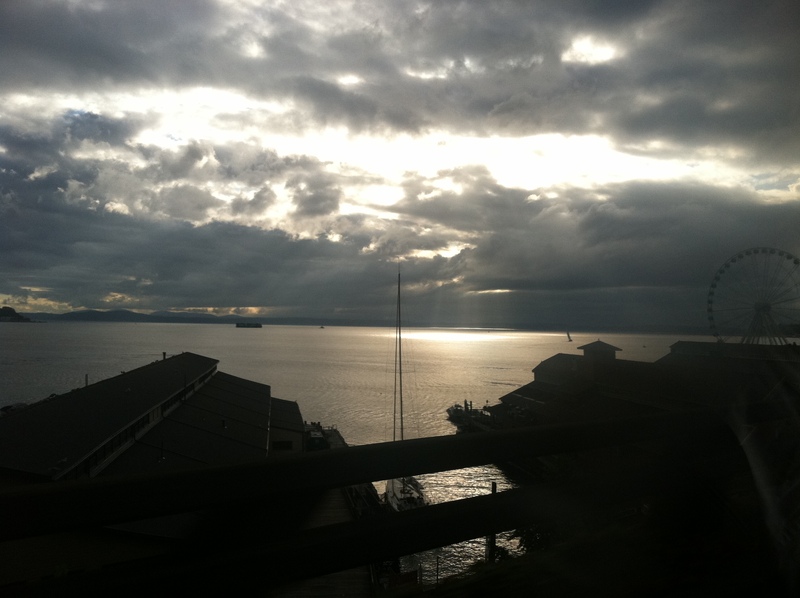 I’m still in base camp Seattle for a couple days, but should have an honest-to-god update by early next week.